The low FODMAP diet is not a life-long diet that you must adhere to… thank goodness! It’s a diet that is designed to identify the causes of your IBS symptoms and give the knowledge to design your future diet. However, the low FODMAP diet is always a safe eating plan to return to when you experience IBS symptoms. So, after you’ve done the FODMAP eliminate phase for 6-8 weeks or so, now what? Well, first off – are you feeling better? If you’re not after 6-8 weeks, re-examine your food intake and see if you may have slipped up somewhere. It may be a different food for you that triggers your symptoms. For example, my body does not tolerate citrus fruits very well, even though most of them are on the “safe” FODMAP food list. The low FODMAP diet is not a gluten free diet, so maybe gluten is your issue. Do you eat bigger meals? That could be your issue because the diet encourages you to eat in small quantities more frequently throughout the day. Or maybe it’s something as simple as medicine, vitamins, gum, even lip gloss or lipstick that you’re using that could be cause your issues. Check anything that goes near your mouth, including a partner that you kiss. Pick a FODMAP group that you want to test reintroducing into your diet. Choose the one you miss the most. I think most people would start with the fructans because of the wheat and spices. This was not my choice since I had learned to live without garlic and onion with the help of some great replacements, like asafoetida powder. Also, being gluten free for a few years, there were many things, like baked goods, that I no longer craved. However, I missed lactose… very much! Once you’ve decided on the first FODMAP group to reintroduce, select how you want to attempt it. Choose a food that you miss in a small quantity during dinner. Why dinner? Because if it is unsuccessful, you will most likely be able to sleep through most of the symptoms and it won’t ruin your entire day. Since I chose lactose to reintroduce first, it would be silly of me to attempt a 12oz glass of milk for breakfast, since the quantity is very large and I would most likely be very sick by lunchtime. Instead, at dinner one evening, I chose to incorporate one of these convenient Pastariso Instant Gluten Free Mac & Cheese Cups that I missed dearly. After you’ve bravely eaten your FODMAP, monitor your symptoms closely and record all the details. Ensure you keep a diary of what you’ve attempted, when you attempted it and all the details to the symptoms you encountered (if any) for the next 24 hours. If you were unsuccessful in your attempt and your IBS symptoms return, you have clearly indicated one of your triggers (yea! ), quantity included. If possible, test a smaller quantity of the FODMAP later in the day and record your symptoms once you are feeling better and your symptoms subside. If you were successful in your first reintroduction, try something very similar in quantity (from the same FODMAP group) again the next day, and track your symptoms. If this was not successful, refer to the red text above. If the second test was successful – awesome! It looks like you can safely eat that for dinner! Now try to have that item earlier in the day (lunch) and track your symptoms. Again, if you’re not successful, read the red text. It is common to be OK with the same quantity of things at dinner, but not at lunch. This was my case. While I had no symptoms with eating my GF Mac & Cheese at dinner, I got stomach pain and bloating about 5 hours later after attempting it for lunch. I didn’t notice this when I tested for dinner because I was sleeping, and in the morning I felt fine. Successful again? Even better! Every time you succeed and feel no symptoms, repeat and add additional quantities of the same FODMAP group to your meal(s). Eventually you’ll get to a point where you notice that the FODMAP group doesn’t impact you at all or you’ll know your limit that you can consume. This process could take from a few days to a month depending on your success rate. Once you have figured out the safe quantity of the first FODMAP, you can move onto testing the next one of your choice. After about 3 months, you should know what you can tolerate and in what quantities so you can design your diet for the future. For me, I can handle galactans at almost all quantities (welcome back hummus! ), and a little bit of lactose, fructose and polyols later in the day. Unfortunately, fructans and I do not get along. Even knowing this, I always eat FODMAP free for breakfast and usually at lunch. This allows me to handle most of my days with ease and go to work like a normal person. The low FODMAP diet (along with any other treatment) will not “cure” your IBS as some people claim. Unfortunately, there is no cure for IBS and personally I don’t think there ever will be in my lifetime. To find a cure, they would need to find a cause first, while still hasn’t been done. The goal of the low FODMAP diet is to manage your symptoms through your daily diet, which has worked very well for me. I’d love to hear what FODMAPs have made their way back into your daily diet, so please feel free to leave your comments. This entry was posted in Low FODMAP Diet, Reintroducing FODMAPs and tagged FODMAP, FODMAPs, Low FODMAP, Low FODMAP Diet, Reintroducing FODMAPs by Heather. Bookmark the permalink. I’m about to start on this lovely adventure next week. Today I cleaned out my pantry and created a shelf of “safe” foods. In all honesty, I’m feeling excited and enthusiastic but daunted and overwhelmed at the same time. My main goal is to see if this makes a difference for my ME/CFS & Fibromyalgia. Glad to know there’s someone who might be available to listen – cheers. Good luck Tracey! Don’t hesitate to reach out with questions along the way! Hi Tracey, how are you coping with your Fibromyalgia now? A friend of mine has Fibromyalgia and she has found that cutting out all Starch from her diet has helped her with preventing most of the pain and inflammation that can come with this condition. 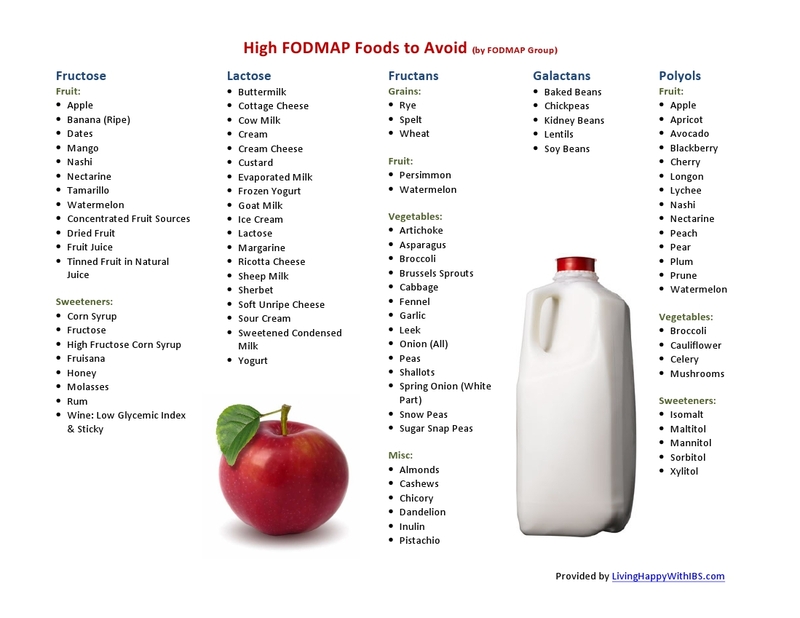 I have tried to follow the low fodmap plan but unfortunately any time I am hospitalized they wont listen to me and served foods that made me sicker.I meet with a dietician Friday who is very educated with my issues. IBS- GASTROPARESIS. & P.O.T.S. I hope she can help me figure out just what I should be eating. I have read up on many sights with what you can eat on a low fodmap diet. coffee seems to be a no no everywhere…but this list on this sight has stated it is alright to have? Simple black coffee is OK and safe. However, where coffee quickly goes high FODMAP is when you start adding coffee flavors, sweeteners and dairy products. Plus coffee is a natural laxative and has been a well-known irritant for those with IBS and IBD, so even though it may be on the “safe” list, I would proceed with caution. I have been doing really well on the low fodmap diet. Almost afraid to add foods since I’m sure some of the results will end in pain. Same here! I have had great success sticking to the low FODMAP diet but have been afraid to start adding things back in. After reading this article about HOW to systematically add foods back in I think I will begin to do it. Is there a reason you have to be on the eliminate phase so long? I’ve been on it a week with symptoms having completely stopped almost immediately when i started. However living in a rural area, the diet is unbelievably hard to stick to. Gluten free stuff is limited and unbelievably expensive, the local supermarket doesn’t seem to stock gluten free bread anymore so i’ve had to order it in from the city which is 1.5 hours away and it’s taking a long time to get here and again is overpriced, the local supermarket due to lack of competition has horrifically bad produce in price and most of it almost off and local produce is limited to potatoes at the moment as it’s getting extremely cold. I really don’t think i can last 6 weeks and since I’m symptom free, there should be no reason i can’t start introducing foods back soon right?? While I’m definitely no expert, I would say that you can flex the diet to meet your needs. If you feel comfortable introducing items back into your diet sooner, go for it! Good luck! Thank you Heather 🙂 as i have been symptom free (without taking ibs support tablets) and there isn’t much more variety available to me I might give it one more week then start introducing foods back in. I had to order in gluten free bread through a local store and after waiting 5 days for it to arrive it was unsliced, was hard, a day from expiring and two small loaves cost $20!!!! Crazy! Hey there, thank you for all the help! I have been trying to figure out for years what is wrong with my stomach (they checked everything from celiac to colitis) and came back to the conclusion that it’s IBS. I’ve been gluten free for about a year and my life is much much better (I also had debilitating eczema since childhood and it has cleared up!) but my other sensitivities align with FODMAPS. However, I can’t seem to tolerate rice anymore and I used to eat rice all the time! Even rice noodles that are “gluten free” seem to bother me. Any thoughts on rice? I don’t have any issues with rice, however there are many items that are low FODMAP that I can’t tolerate, like coffee and citrus fruits. As long as you’ve figured it out, great! We are doing the low FODMAP diet for my 4 year old son, and are having good results. As we get closer to the end of our elimination phase we are starting to think about how to reintroduce those foods. Your post has been great for that. Our concern is that our son is too young to be able to recognize, understand and voice the symptoms you describe. We’re your symptoms the same for each trigger food that affected you? For example, if we’ve missed something and it slips through, it seems to take more than 5 hours for the bloating to go away, and I’m not sure if we’ve noticed the bloating 5 hours after or if it has taken longer. Any advice? Monitoring the symptoms of a child will be difficult. My symptoms included gas, bloating, diarrhea, and pain. Many people also have constipation. Each person is different, and I can confidently say that I’ve had bloating that’s lasted days (I wish it was only 5 hours!). For your son, I would question him frequently to see how he’s feeling, and keep a very detailed diary so you know where the issues are. Is it likely that one particular FODMAP group will cause more issues than another? Ie, can we generalise to the point where Fructans as a whole may affect you but another group won’t, or is it really food specific, ie, broccoli may be an issue, but asparagus isn’t? Each person is unique and may react to foods in a different way. Typically, a person will react similar to all fructans (or other FODMAP group) regardless of the item. Once you’ve identified which FODMAP group you react to, you can start seeing if certain foods in that group impact you in a different way. Eggs and cheese seem to set off my IBS what about you guys!